The name of the next Imperial era, known as gengō in Japanese, will be announced on April 1, Prime Minister Shinzo Abe confirmed Friday. “Tradition dictates that the name of a new era is decided on and disclosed to the public following the start of the new Imperial era,” Abe said during a New Year’s news conference in Ise, Mie Prefecture, following his annual visit to the Grand Shrines of Ise earlier in the day. “However, I believe it is best to announce the name on April 1, prior to the Crown Prince’s ascension, so as to minimize the impact the change may have on the lives of the Japanese people,” he added. The new era name will be made public soon after it is approved at a Cabinet meeting on April 1, a month prior to the start of the new era. Crown Prince Naruhito is set to accede the Chrysanthemum Throne on May 1 following Emperor Akihito’s abdication the day before. “The government will put its best efforts into preparing for the new era, so that the public can celebrate the historic succession of the Chrysanthemum Throne,” Abe said. The announcement follows months of speculation over when the new era name would be revealed. The decision over when to make the announcement has proved to be a delicate balancing act between following age-old traditions and adapting to the requirements of the digital age. According to local media reports, conservative politicians had voiced concerns over issuing the name of the new era while Emperor Akihito is still on the throne, citing reasons such as the risk of giving an impression of there being concurrent authority between the old and new Emperors. They believe in the principle of associating one gengō to one emperor, and called for the new era name to be announced and issued after the ascension of the Crown Prince to maintain tradition. But the government had also been keen to ensure a smooth transition to the new era by securing adequate time for computer systems and software to be updated in time for May 1. In Japan, the Imperial era is still used in official documents and public records such as those related to tax or pensions. 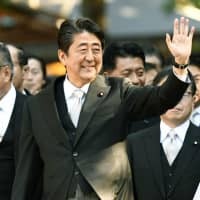 Friday’s announcement suggests Abe put the need for time to iron out any technical glitches ahead of the concerns raised by his conservative base.